fancy that jane: Get On Board! May is National Scrapbooking Month and to help celebrate, Stampin' Up! has given us two very cool specials. 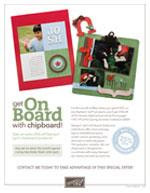 The first and most exciting is a 25% discount on all On Board ch ipboard products featured on pages 178-179 of the Spring-Summer 2008 Collection with any $35 purchase of non-chipboard products. You read that right! All you need to do is purchase $35 of Stampin' Up! merchandise and you will automatically get a 25% discount on the prices of every chipboard product on pages 178-179. This is an awesome promotion for everyone because chipboard is so versatile! You can use the chipboard accents plain, stamp it, cover it with designer paper or card stock, emboss on it, glitter it up or color it with craft ink. You can use it as accents on cards and scrapbook pages or to create home decor items. The possibilities are endless! And if you're wondering what non-chipboard products to purchase this month, why not take advantage of the other Stampin' Up! special -- the cutting Combo Pack. Now through the end of May, buy a cutting mat and get the hobby blade free! The cutting mat and hobby blade are great tools to use to cover your chipboard with card stock or designer paper-- just what you need to get the most use out of your chipboard! And since the cutting mat is only $15.95, you can spend the rest of the money on some designer paper, SNAIL tape, ribbon, glitter or whatever else you'd like to use to jazz up your new chipboard. You really cannot go wrong with these specials, so take advantage of these offers and stock up now! E-mail me today at junglejanelee@gmail.com to place your order!